A year after Ayotiznapa. Why we need an anti-capitalist and socialist organization? The massacre in Iguala, Mexico in September 2014 made the crude reality of the Mexican political regime even more evident. The disappearance of the 43 education students (normalistas) in Ayotzinapa sparked a massive movement condemning the entire regime, taking up the slogans #ItWasTheState and #PeñaOut (in reference to Peña Nieto, the Mexican President). In light of these events, there is a debate amongst the left about the youth and workers’ tasks. 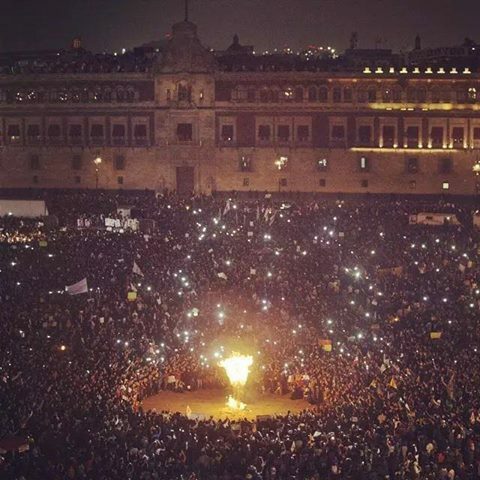 The movement for Ayotzinapa and for the return of the 43 students alive reached its highest point on November 20 when Peña Nieto was forced to cancel the military parade in the Zócalo (main square) of Mexico City and a mass of hundreds of thousands marched to the center of the city. Workers were also participating in the movement and organized work stoppages, particularly the CNTE (teachers’ union) and the UNT (“opposing” unions) with the telephone workers’ union. 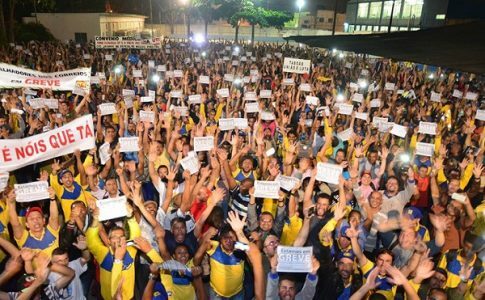 This goes to show that the mobilizations were so large that they forced the unions that were not aligned with the government to mobilize the rank and file workers. This movement sparked a deep crisis of political representation: the massacre in Iguala posed a new turning point in the history of the country. The Ayotzinapa movement surpassed the traditional left organizations. For example, the EZLN, despite having participated in the global actions for the return of the 43, expressed the political impotence of autonomism via their declaration on November 16 when the Zapatista leadership suggested that those who were mobilizing for the 43 were doing so because it was a “fad.” During the last few days of the mobilizations, the EZLN limited their demonstration of solidarity to their seminar on confronting the “capitalist hydra” , in which they developed the idea that “each individual should cut their head off the Hydra,” which, in turn, further isolates the different struggles. The Ayotzinapa movement also presented a new generation of youth that came out to struggle after the #YoSoy132 movement and the movement in solidarity with the CNTE in 2013. Thousands of students throughout the country organized student assemblies, were repressed, and protested for the return of the 43 students — alive. The strong presence of youth in the movement also raised the question of politicization and an important discussion about strategy. What was necessary for Peña Nieto’s downfall? 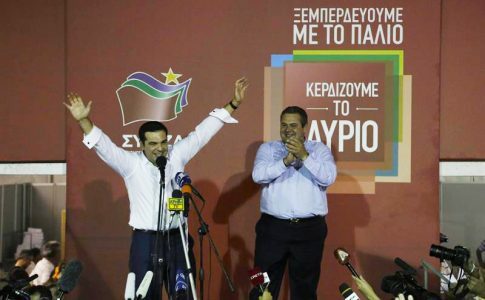 They debated in youth assemblies; it should be pointed out that this movement founded a new generation of activists, intellectuals, and militants. The massacre in Iguala showed that the so-called transition to democracy never existed, and it revealed the crude reality that the country was full of hidden mass graves, that the regime still practices forced disappearances with the participation of the 27th Armed Forces Battalion that tortured the disappeared. The Italian intellectual Massimo Modonesi suggests that the Ayotzinapa movement presented a new opportunity for the left. It indicated that there exists a subordinate left, an opposing left that is still being born. It was a reality that was in the making before Ayotzinapa, particularly through the MPJD (peace movement of 2011), #YoSoy132 and the teachers’ struggle of 2013. For years, new anti-capitalist organizations were growing in number due to an increase of a new wave of mobilizations. Some intellectuals, like Modonesi, argue that Mexico is a breeding ground for the emergence of anti-capitalist and socialist revolutionary projects. It’s fertile terrain. There is s a serious crisis of political representation and great unrest that still has not been capitalized by the autonomist left (EZLN) or the National Regeneration Movement, MORENA: although Andres Manuel Lopez Obrador, AMLO, is gathering the most political support, it is still not enough to co-opt the angst that arose in response to the massacre. 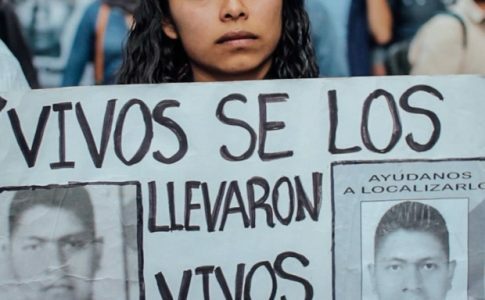 In many ways, the Ayotzinapa crisis opened a new historical opportunity for the left: the rise of a new workers’ and youth anti-capitalist and socialist organization on a national level is possible. In the last few months a series of important workers’ struggles have developed: San Quintín, CNTE, EATON, Foxconn, Sandak, Honda, the IMSS (Health Workers), who, despite the attacks on workers, insist that the working class be an entity that struggles and resists. The socialists of the MTS have participated in the latest and most advanced struggles of the youth, workers, women and the LBGT community. Recently, we participated in #YoSoy132 and the struggles with the CNTE, SME, and IMSS. We founded the women’s group Pan y Rosas Mexico, which is a renowned organization that calls for a Women’s Day demonstration every year. During the Ayotzinapa movement, we put all our strength in broadening the movement for the presentation of the 43 students alive. 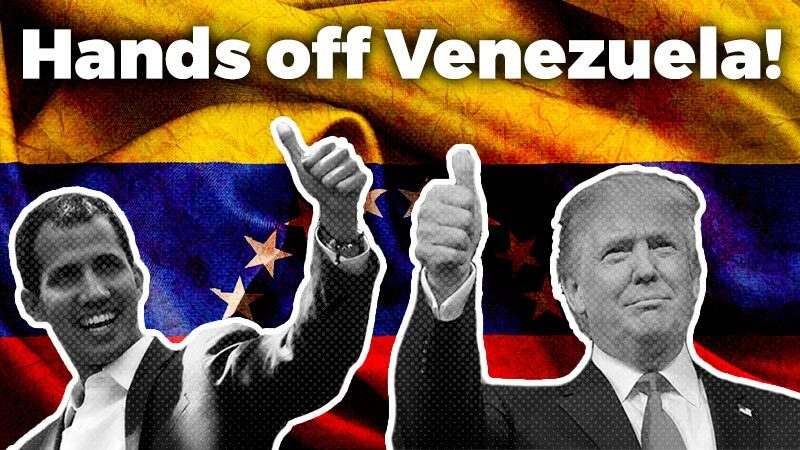 We are part of the left that never aligned itself with the Mexican regime. 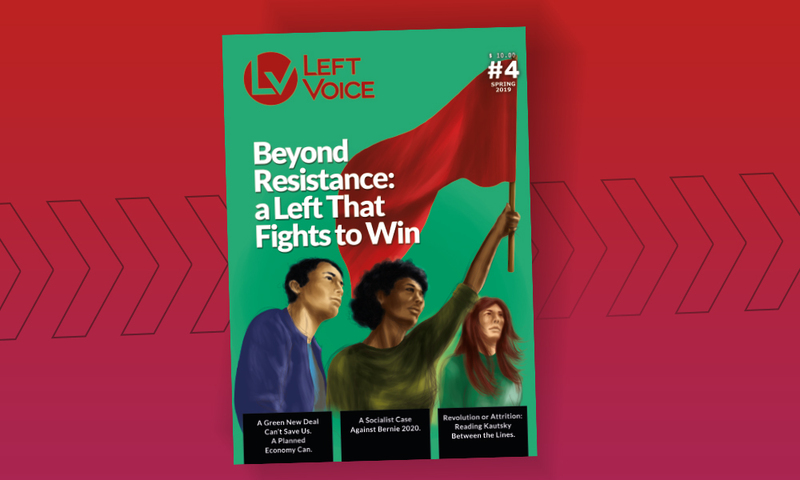 During the most critical times of the movement, we fought for the idea that the workers and the youth could impose the fall of Peña Nieto by revolutionary means. In November, we stressed the idea that it was key for the movement to call for a general strike that unified the opposition unions such as the CNTE, the UNT and other unions like the CTM (historically aligned with the PRI), calling to break with the isolation and join with non-unionized workers. As in Egypt and Tunisia, the fall of Peña Nieto was possible by the independent mobilization of the working class, implementing its own historical methods of struggle. 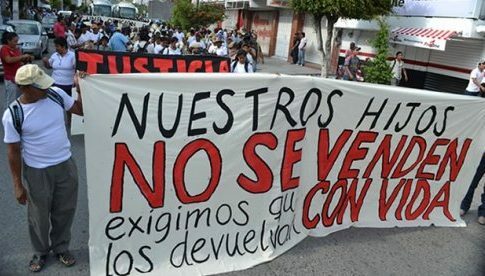 A year after the disappearance of the 43 students, the attacks continue and escalate. The selected killings of students and journalists continue, such as Rubén Espinosa and Nadia Vera. Austerity plans also persist, for example in public education, the pillaging of natural resources, and the expropriation of the indigenous lands of Xochicuautla to build a highway. Alongside the unification of all the current struggles, its imperative to build a strong anti-capitalist, socialist organization that sets its objective in rooting itself in the heart of the industrial Mexican working class. The industrial working class, due to its social composition and position of strength in the economy, will be the key player of a second Mexican revolution, a revolution that can only be working-class and socialist. Therefore, there is an urgent need to build a new anti-capitalist socialist organization, of the workers and the youth. We invite you to learn about the MTS (Movimiento de Trabajadores Socialistas). Leon Trotsky suggested that “Without a guiding organization, the energy of the masses would dissipate like steam not enclosed in a piston-box. But nevertheless what moves things is not the piston or the box, but the steam.” In many ways, during the Ayotzinapa crisis, a revolutionary leadership was missing to help the movement defeat Peña Nieto. Inside a country filled with discontent, and with the growing attacks against the workers from the government, the construction of this organization is of essence.